In select countries —notably excluding the U.S. so far —people wanting to pay for iTunes, iBooks, App Store, or Apple Music purchases can do so through carrier billing, which simply adds the cost onto monthly phone bills. Here's how to set that up, whether you're on an iPhone or another device. 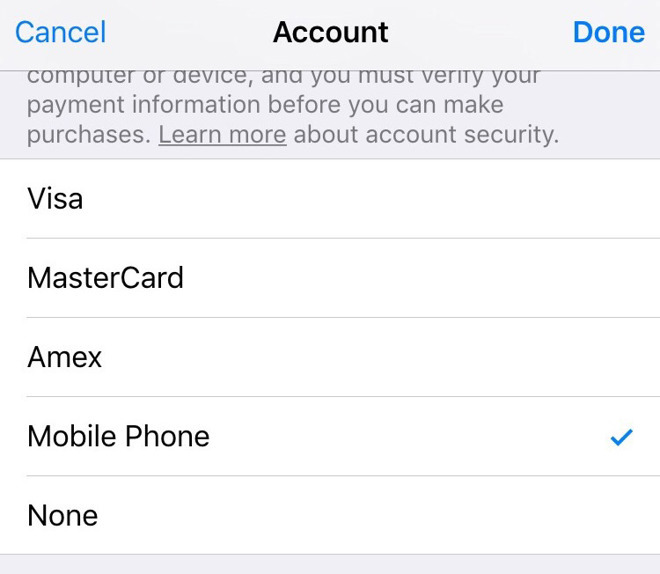 From here users should tap on Payment Information, and select "Mobile Phone" as their payment method. On iPhones, hitting "Use This Mobile Number" will automatically verify carrier info —alternately, "Use a Different Mobile Number" will push out an SMS message with a one-time code to a separate device, which must then be entered on the original device before hitting "Verify."